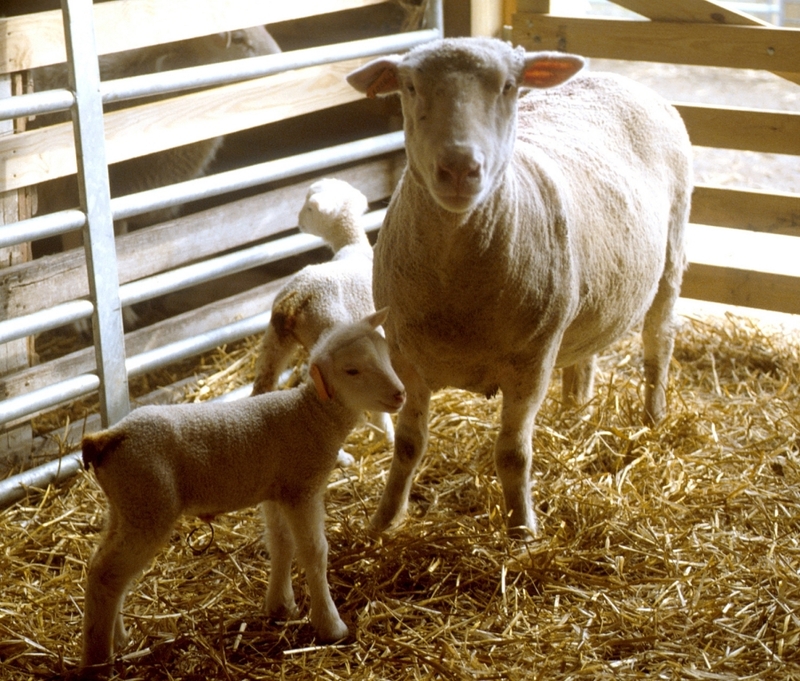 Abortions in sheep and goats are common submissions to the Animal Disease Diagnostic laboratory (ADDL), particularly in late winter and spring. The ADDL has assembled a multi-discipline diagnostic panel approach to guide practitioners on samples needed, tests offered to address most typical abortion-causing pathogens, and the cost of the workup. The goals are to present a thorough diagnostic plan that is expedient to collect, provide a working differential diagnosis, and that is done at an affordable price. Fresh samples that are most useful – required – include placenta with cotyledons, abomasal content, and fetal tissues including lung, liver, spleen, and kidney. Formalin-fixed tissues to submit include placenta (2-3 cotyledons), brain, thymus, heart, lung, liver, kidneys, spleen, adrenal gland, section of ileum, and additional striated skeletal muscle (e.g., tongue, thigh). The latter tissues are helpful in cases of protozoal associated abortions (in addition to heart and brain). A practitioner submitting samples can simply list “Abortion Panel” for a set of samples submitted, and there is no need to list all of the tests described below. Other PCR assays are available to detect other pathogens that are not included in the panel, if warranted such as Toxoplasma gondii. The panel is available for $225.75; note that this does not include the price of a necropsy examination, which is also available at the ADDL upon request. In addition, the ADDL offers a serology panel to assess if dams have been exposed to significant pathogens that may cause reproductive failure. 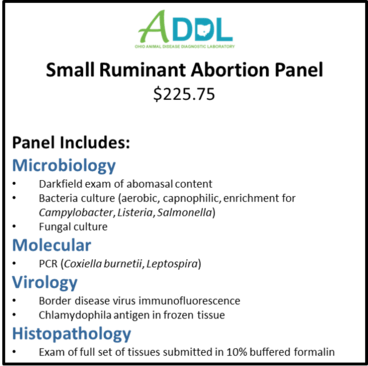 Currently, a small ruminant abortion serum panel includes testing for antibodies against Leptospira (6 serovars), Toxoplasma, Brucella and BVD/BDV for $31 per sample. Remember that interpretation of results may be best served by submitting a convalescent sample 2-3 weeks following the collection of the first sample. These services and others are listed on the ADDL Diagnostic Panels website. 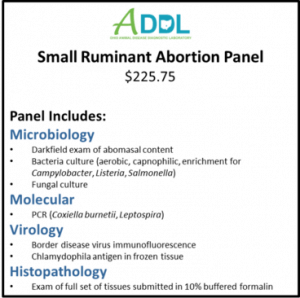 ADDL staff are also glad to speak with practitioners and producers about these services and others by calling 614-728-6220. Posted by Braden Campbell at 8:00am March 6, 2019 Posted in Resources and tagged Reproduction, Resources. Bookmark the permalink.